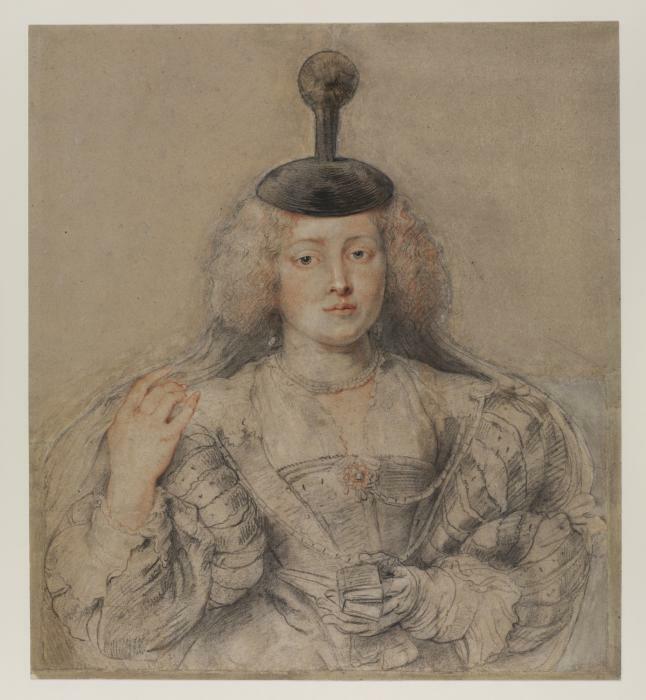 Peter Paul Rubens, Hélène Fourment, c. 1630, chalk and pen and ink, 24 x 21 1/2 inches; The Courtauld Gallery (Samuel Courtauld Trust). History has given us plenty of silly headdresses. But what, exactly, is that thing on her head? In this drawing, currently on display at the Frick Collection, Hélène Fourment is depicted in perfectly period attire, with a devotional prayer book in one hand and the other modestly lifting her veil to capture the viewer’s gaze. 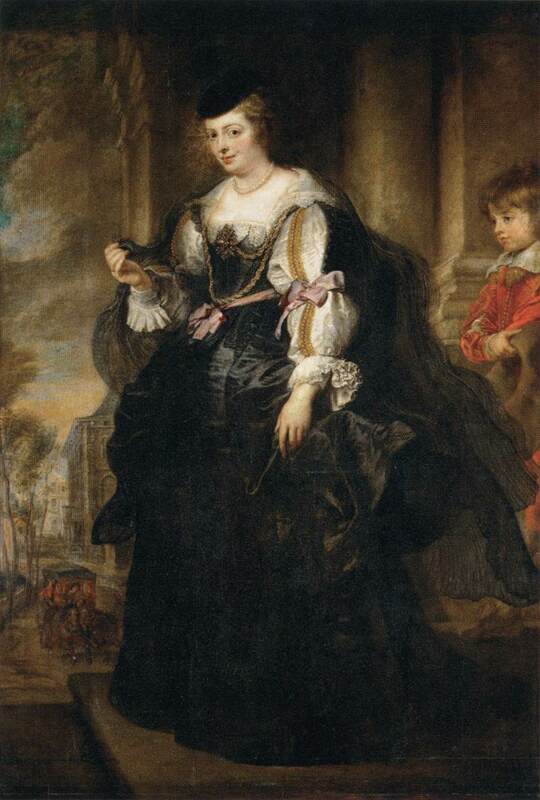 She was the second wife of Peter Paul Rubens, who often used her as model and muse. She is featured prominently—and flatteringly—in many of Rubens’ works. Rubens was particularly sensitive to fashion of the time and rendered it in detail—this headdress, then, could hardly be a mistake on his part, but a conscious reflection of a legitimate accessory of the early part of the seventeenth century. 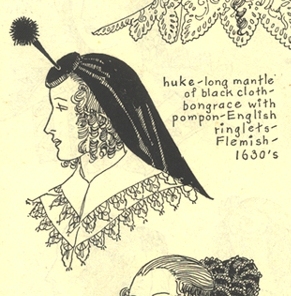 Hélène’s headdress has three components: the distinctive pom-pom, the rounded crown portion, and the veil. It appears in other surviving works by Rubens. 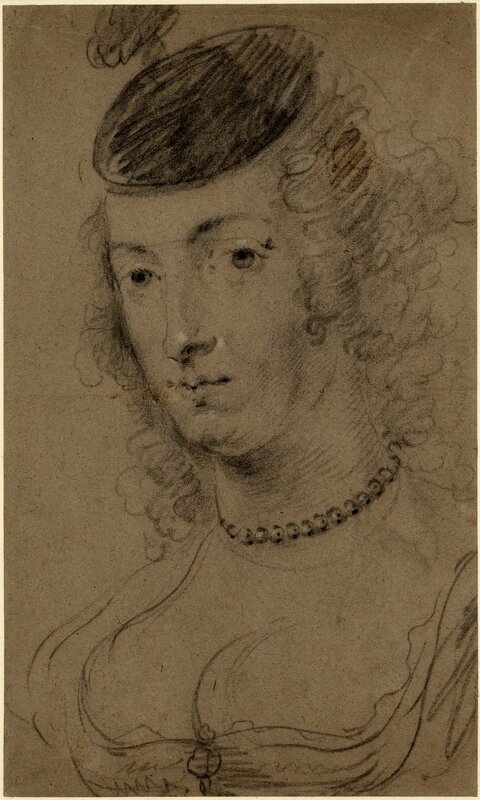 Peter Paul Rubens, Study for a Portrait of Hélène Fourment, c. 1638-1639, chalk on paper, 43cm x 26 cm, British Museum. Peter Paul Rubens, Hélène Fourment with a Carriage, c. 1639, oil on wood, 1.95m x 1.32m, Louvre. Detail of plate from The Mode in Hats and Headdresses. Jacob Gerritsz. 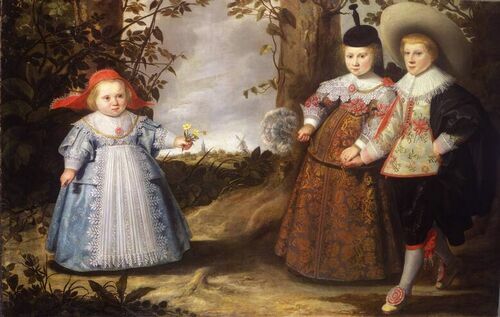 Cuyp, Three Children in a Landscape, c. 1635, oil on canvas,130 x 198 cm, Museum Boijmans van Beuningen. 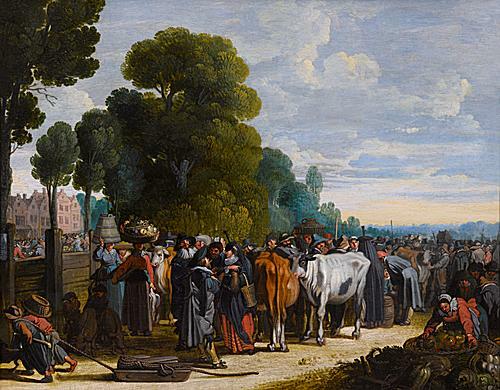 Attributed to Govert Jansz, called Mijnheer, Earth: Elegant Figures at a Vegetable and Cattle Market, after 1619, oil on panel,25cm x 30cm. In the nineteenth century, Braun and Schneider recorded the headdress in their annals of costume history. 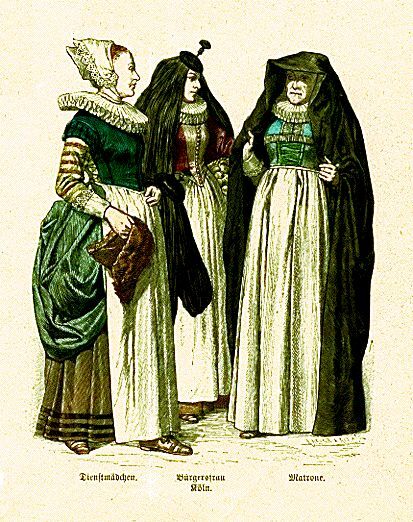 Plate 54D from Braun and Schneider’s The History of Costume. From Arabic garment of the Middle Ages to a potlid with a pompom–what a curious accessory! Thanks to Hélène Fourment and Peter Paul Rubens for bringing it to our attention! Calasibetta, Charlotte Mankey and Phyllis Tortora. Fairchild Dictionary of Fashion. New York: Fairchild Books, 2003. Historic Costume in Pictures. New York : Dover Publications, 1975. Murray, James A. H., ed. A New English Dictionary on Historical Principles. Oxford: Clarendon Press, 1901. Strachan, Edward and Roy Bolton. Old Master Paintings and Drawings. London: Sphinx Books, 2009. Wilcox, R. Turner. The Mode in Hats and Headdress. New York: C. Scribner’s Sons, 1945. This entry was posted in Fashionista Friday and tagged 17th Century Fashion, headdress, Helene Fourment, Peter Paul Rubens, pompom, veil. Bookmark the permalink. you hire a sales issue. There are occasionally even companies that offer quality services. At this time as to avoid showing up that top will aid out with these problem areas?